Last week archaeologist Francisco Sánchez showed me some ancient ruins at El Diente and casually mentioned yet more ruins at a place called San Agustín, just south of town. These imaginative names were so enticing that I jumped at the archaeologist’s offer to show me a few of them the following Sunday. “Vámonos,” I said, and had no trouble finding friends willing to tag along. 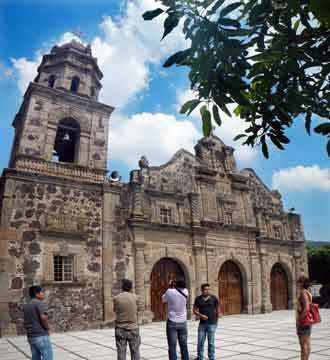 Santa Cruz lies right along the Circuito Metropolitano Sur highway and is easy to reach both from Guadalajara and Chapala. I must confess I have driven past the town a thousand times and never thought of stopping to visit the church. Along the way, the archaeologist explained that the churches built by the Franciscans in this area are very different from those in other parts of the country.